Roll forming can be described as a continuous bending operation done at room temperature in which sheet or strip metal is plastically deformed along a linear axis. Tandem sets of rolls (known as roll stations) shape the metal stock in a series of progressive stages until the desired cross-sectional configuration is obtained. The process is quite cost effective when annual production requirements exceed 50,000 feet. Although sometimes roll forming is utilized regardless of quantity when dimensional consistency is of critical importance. Roll forming can achieve closer tolerances than are possible with most other competing processes. Uniformity throughout the part assures precision fit, simplifies production, speeds assembly and minimizes rejects. Cold roll formed shapes can offer superior surface finish. Sharp clean contours can be maintained. The absence of die marks on the material often eliminates the need for additional finishing. Almost unlimited length parts are possible. The only limitations on part length are dictated by material handling and shipping capabilities. Once the tooling is made, almost any length shape can be rolled economically. 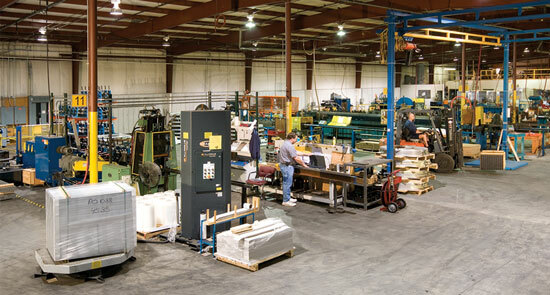 Many additional operations, such as punching, notching, welding and bending, that otherwise would have been performed as secondary operations can be incorporated into the roll forming line, reducing handling and processing costs. Pre-punching inline allows holes or slots that cannot be done as a secondary operation because of their location or features of the part to be included in the shape. Roll formed materials generally have a strength advantage over competing processes in structural rigidity applications.